I’ve been spending so much of my time promoting Alongside Night in all its editions — novel, movie, graphic novel, and audiobook — that I have been neglecting to promote my brand-new nonfiction book, The Heartmost Desire, released in September as both a trade paperback and a Kindle edition which is only $2.99 for full purchase. Friends: I consider The Heartmost Desire to be both my most personal book and my hardest-core case for individual liberty. This is the book I wrote to appeal to people who need examples from real life for why liberty is necessary for personal happiness and neither State nor organized religion can free their soul. The Heartmost Desire also contains my autobiographical description of the experiences that led me from atheism to God, but still relying on reason and rejecting religion, scripture, and faith. I have just set up a promotion on Amazon.com which will run from November 1st through 5th, 2013. 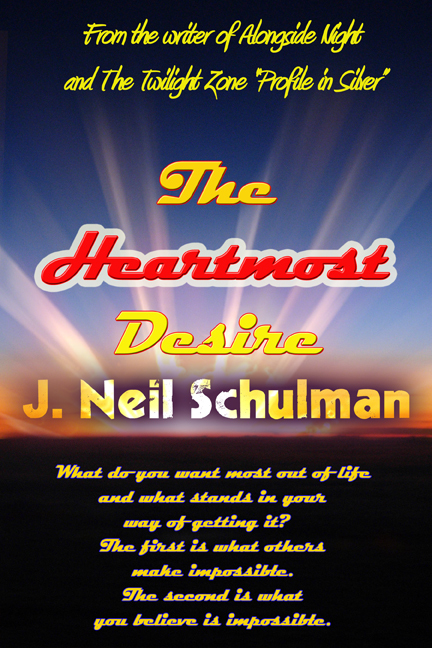 For the first five days in November 2013 the Kindle edition of The Heartmost Desire will be FREE. Kindle editions can be read not only on Kindles but on any tablet or smart phone as well as any desk or notebook computer since there are Kindle apps for just about anything. Don’t miss this opportunity and please pass this along to your friends. Remember, the free Kindle edition promotion begins on November 1st and ends November 5th! Over the years many fans of J. Neil Schulman have said they want another book by him. Sometimes you get what you ask for … but it’s not always what you think you want. Neil Schulman is one of those writers who doesn’t just write the same book over and over and over. He writes a book when he has something to say. A libertarian defends the right to be wrong. It takes a lot of effort to initiate force or fraud. Short of that, the libertarian is tolerant of actions that liberals and conservatives cannot understand. But a libertarian also has the right to judge the value of values. A libertarian can have common sense. He can weigh the good and the bad in the shadowlands where ideas have yet to be put into practice. There is one kind of libertarian who will derive no benefit from the words that follow. That is someone who has no heart. Join discussion of The Heartmost Desire on its official Facebook page. I’m definitely tardy in posting these videos here, but I think I can claim a good excuse. Aside from supervising a new cut of the Alongside Night movie after getting audience feedback from our series of “Sneak Peek” screenings this past summer, I’ve also been shepherding release of the new Alongside Night Movie Edition — now available on Amazon.com as both $2.99 Kindle edition and a printed trade paperback; the new Alongside Night Graphic Novel scheduled for release by Thanksgiving in both printed and Kindle editions; and the new Alongside Night Audio Book planned for release by the holiday season on Audible.com/Amazon.com and iTunes. And I’m writing a new novel before I’m back in the saddle for what’s now planned as a 2014 release of the Alongside Night movie — more details on that when our theatrical distribution is locked in. Meanwhile, here are three new videos to tantalize you. The Official Teaser Trailer for Alongside Night by Brian Brinkman. Two years ago when I asked Soleil O’Neal-Schulman to compose a theme song for the Alongside Night movie based on the poem I’d written back in the 70’s for the forematter of the novel I did not specify a style for the song; and a month or so ago our discussions involved how her more recent music was more alternative and less likely to satisfy what I was looking for. I simply told her, “I trust your judgment; I trust your taste” — and left it at that. 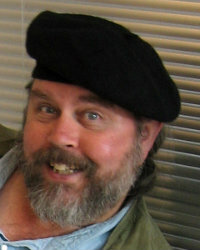 Soleil provided a first-draft full production of the song to Alongside Night composer, Daniel May, and the final production is their collaboration. After a series of sneak-peek screenings in summer 2013, it became evident that the placement of the theme song in the end titles and credits was leaving the song unheard by a lot of movie viewers in the habit of walking out as soon as the credits start. So, we have just done a new cut of the movie where the title song is moved near the movie’s opening with a “Goldfinger” style visual sequence. The “Goldfinger” song over a golden body acting as a lens to scenes later in the movie became so popular it was used in later Bond movies and even by Hitchcock in his 1966 spy thriller, Torn Curtain. We’ve also upgraded the end credit sequence with visual footage of Jordan Page’s live performance of the freedom anthem “Unchained,” second of the songs Soleil wrote for Alongside Night, and an edited version of the speech Adam Kokesh wrote and performed at that same rally scene, which you can see uncut in the video following this. 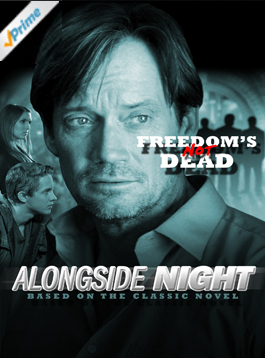 Soleil O’Neal-Schulman’s Theme Song for the motion picture, Alongside Night. Copyright © 2013 Alongside Night, LLC. Song Copyright © 2012 Alongside Night, LLC. 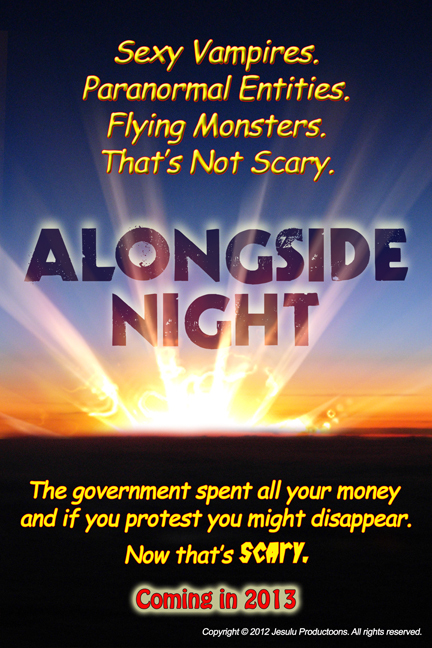 On January 20, 2013, Adam Kokesh performed an original speech he’d written for the rally scene in the motion picture at that time in principal photography, Alongside Night. Here is that uncut speech. None of the crowd reaction to Adam’s speech from the volunteers and extras was choreographed or directed. 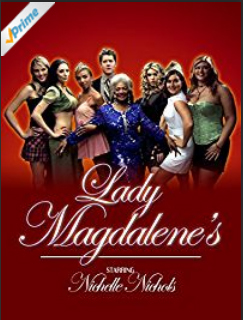 This is unedited footage and does not accurately represent the final production values of the completed Alongside Night motion picture.This is footage without sound mixing, editing, post production, or color correction. The opinions expressed in this video are those written by Adam Kokesh and do not represent the views or opinions of the producers, cast or crew of Alongside Night or of Alongside Night, LLC.